Vogue’s April issue features on its cover 14 female celebrities from around the world, including US actor Scarlett Johansson, French actor Léa Seydoux, Bae Doona from South Korea, and Chinese pop star Angelababy, or Yang Ying in Chinese. 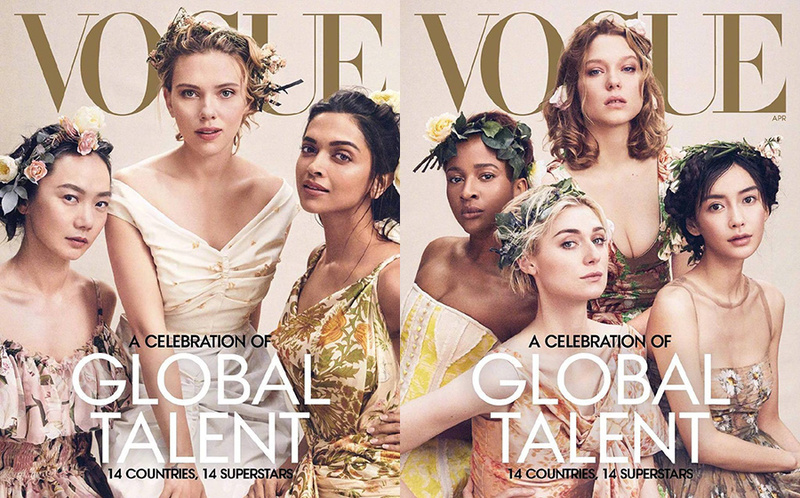 With the headline “a celebration of global talents”, Voguepublished two editions of the issue, which has sparked online debate at home and abroad. In the West critics are taking the magazine to task for placing white women in central positions on the two covers. On the main cover, Scarlett Johansson is surrounded by Doona Bae and Indian film star Deepika Padukone. In the alternative cover shoot, Australian actress Elizabeth Debicki and Léa Seydoux take prominent positions, with Nigerian star Adesua Etomi-Wellington and Angelababy on the periphery. A number of netizens have slammed the magazine for preaching, but not practicing, inclusivity, while others have said the placement was not racial in character.